The W10109T2 is Cartier's Must 21 series model with a perfect pick for elegant evenings. 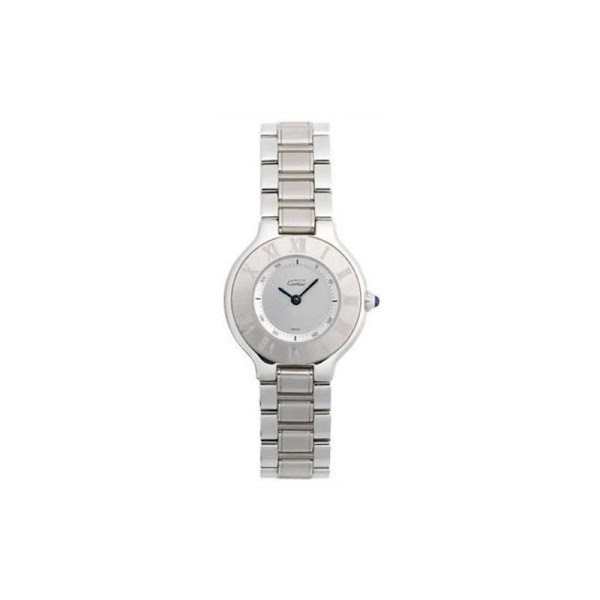 This wristwatch is a gorgeous statement of contemporary and feminine. This Cartier watch features a scratch-resistant sapphire crystal, a stainless steel bracelet band with a deployment clasp. Besides, this timepiece has a clean silver dial with two slim, sword-shaped hands, an outer dial with small black indices, and Roman numerals on a silver-tone stainless steel bezel. You can find an original Cartier W10109T2 Watch at the site(s) listed above. However, we don’t guarantee its availability as being listed here simply means that those site(s) has the item in question by the time we wrote the review. The review in this page is written by garnish at Sunday, September 18, 2011. The post is tagged as analog, cartier, watch, women.